This grain-free rainbow bagel recipe situation is pretty much my favorite combination, since it comes with sweet dairy-free cream cheese topped with paleo rainbow bagels. Party on the top, party in the back, and party in the middle. And the dough is super fun to craft. Do you want to know what else is super awesome about this bagel recipe? It’s grain-free, and still has a bagel boil step before you pop it in the oven. Most of the other grain-free bagel recipes out there are basically muffins baked in doughnut pans. But not this one! The bagel boil coats the bagel in a chewy outer layer with a melt-in-your-mouth maple flavor. I know I’m doing something right when the smell of the oven brings my boyfriend into the kitchen hungry. 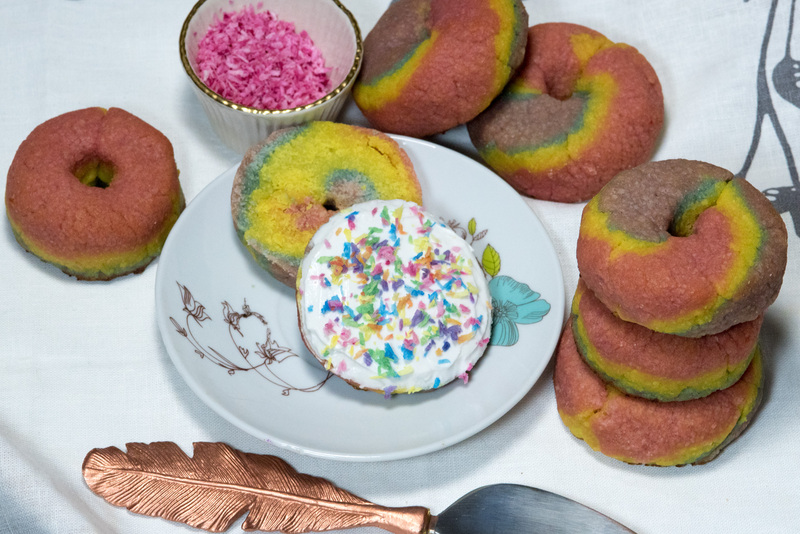 This paleo rainbow bagel recipe is grain free and gluten free. Stir up a little psychedelic fun in your morning routine with a paleo rainbow bagel topped with dairy-free cream cheese and paleo rainbow sprinkles. Party on! Stir together the water, maple syrup, and olive oil in a mixing bowl until well combined. Sprinkle the yeast on top, and wait a few minutes. Add the egg, and whisk until fluffy. Combine the flours and salt together, and fold into the water mixture. The dough may flake at first depending on what you mix with, but it should hold together well as you fold it on itself. Prepare six colors of natural dye in six small bowls with a little bit of water. More pigment is better and makes for brighter rainbows. Separate the dough into six even balls, and mix each ball into one of the dyes. I pressed the dough out into crumbles with a fork, and then folded it together until the color was well combined. Preheat the oven to 450 degrees. Prepare the water bath in a saucepan, and bring the water to a boil. With a spatula, carefully scoop a rainbow bagel into the water bath. When it floats to the top, scoop it out and transfer to the baking pan. Garnish with dairy free cream cheese, paleo rainbow sprinkles, and enjoy! Original perfect paleo bagel recipe from Cook it Up Paleo. Original Rainbow Bagels from The Bagel Store in Brooklyn. Take the dry edge off any breakfast pastry with this dairy-free cream cheese recipe made from coconut milk and lightly sweetened with maple syrup. Paleo and Whole 30 friendly. Put the coconut milk cans in the fridge for a few hours so the layers separate. Don't skip out on the coconut milk, guys. Get the full fat canned version by Goya from the International Section at your local grocery store. It will make your life soooo much easier. Don’t buy the reduced fat, coconut cream, or no additives can. The coconut milk only separates properly in the full fat version with additives. Do not shake the cans. Pop open the coconut milk cans, and scoop the thick layer of coconut milk cream on the top of the can into a bowl. Save the rest for later. Transfer this to a doubled up piece of cheesecloth, and squeeze out extra liquid until it reaches the consistency of cream cheese. If you squeeze out too much, add a little of the leftover coconut milk in to achieve the right texture. Stir in the maple syrup until well-combined. Top off a bagel straight away, or refrigerate for later. What do you do with the rest of that coconut milk? Toss it in the blender with some pineapple and banana for a pina colada flavored smoothie! Rum optional. Original recipe from Spunky Coconut. Paleo Rainbow Sprinkles made from coconut flakes and all natural food dye are so much healthier than regular sprinkles and bring a dash of fun to any dish! Spread the coconut flakes in an even layer on a tray, and dehydrate for 6-10 hours until dry. Pre-mix the natural food dye in 6 small containers by adding the powdered dye to a little bit of water. 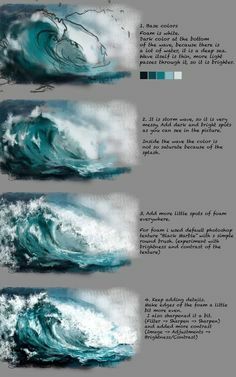 Be bold with the color - it's cooler when it's super saturated! Evenly divide the dried coconut flakes into 6 small piles. Add one pile to each dye mix, and combine well. You can mix these in a small bowl with a fork, or put it in a plastic bag and shake it really well. Ta-da! Taste the colors of the rainbow! There are a few rainbow bagel videos out there, but for the real authentic deal check out this one about the original rainbow bagel from The Bagel Shop in Brooklyn. Since their dough isn’t primarily made from almond, it holds together in a gooey dough on a scale that has the freedom to drip and marble. Take a cue from them on how free to be with your rainbow bagels! They’re more fun when you don’t try to make them absolutely “perfect”. Also, the more pigmented the food dye is, the better! Let your grain-free rainbow bagel shine.